Aquariums are an amazing sight to behold and they add an aesthetic feel and look to an environment. It isn’t surprising to know that while people go to work, visit friends, or even plan long vacations, they tend to forget to make arrangement for the feeding of their fish when they’ll be away. An automatic fish feeder dispenses fish feed at specified intervals. You can program the equipment to feed your fish anytime you want. So while you are away, your fish won’t starve as they will be fed at their regular feeding interval. There are lots of automatic fish feeders out there but please check our top 5 products below. Eheim Battery Operated Auto Fish Feeder is one of the most popular automatic fish feeders for ponds and for reef tanks. This equipment gives you the freedom to customize the quantity and feeding interval of your fish. This automatic feeder has a robust structure and special design that includes an LCD screen. It also allows you to set the feeding interval to a maximum of eight times a day. It comes with a universal installation clamp that makes it much easier to install in any tank. This automatic fish feeder comes with an inbuilt fan that keeps the food dry always, this means you don’t need an air pump. This fish feeder features a drum volume of 3.3 fl. ounces or 100 ml. It is capable of dispensing different types of food, and you can also use it to feed turtles, newts, and frogs. It also features a manual release button that lets you feed your fish outside the time you programmed. This feeder can last for about six weeks of feeding, and all you need is just 2 AA batteries to power the system. It also has a battery indicator that lets you know when the battery needs to be replaced. This feeder comes with a simple operation mechanism and it is easy to install and use. It also features a LED display and it lets you feed your fish up to four times a day. It comes with an adjustable slider that lets you set and fix the exact portion of fish feed you want. This automatic fish feeder is powered by two AA batteries that can last up to the time frame of twelve months. It also features a moisture-resistant hopper to keep your fish food fresh at all time. It’s capable of accommodating several kinds of food, and if you are looking for an automatic fish feeder for pellets, flakes, and crumbles, then this might be the best option for you. 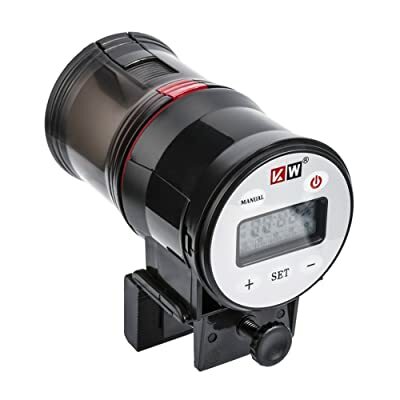 Its LCD display allows you to program the quantity and time interval of feeding your fish. It is a great option for aquariums and terrariums, and it is also a recommended product for feeding frogs and turtles also. The capacity of the container is 175 ml, and it can contain enough food for your fish. NICREW Automatic Fish Feeder features a highly efficient ventilation system. The system is integrated with a fan that helps to keep the food in the storage dry at all time. 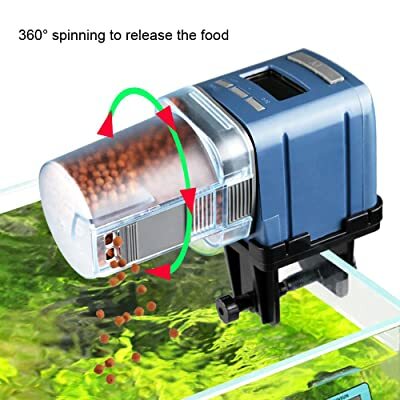 This automatic fish feeder has the ability to rotate about three times every feeding time. It also features a power on/off button that gives you the flexibility to program the system whenever you want – this gives you full control over the system. This automatic fish feeder for reef tanks is an ideal option, and it can be used for both marine and freshwater fish. The installation of the device is simple, and it is easy to use. This device is powered by 2x AA batteries, this means you can use it on the go as it doesn’t require an external power. It also features an alternative rotation times and a changeable slider that lets you adjust the quantity of food. The device also lets you set the feeding interval to a maximum of five times every day. This NICREW Automatic Fish Feeder is moisture-resistant – keeping your fish food fresh always. The lever of the feeder can be adjusted to single, double, or thrice every feeding time. 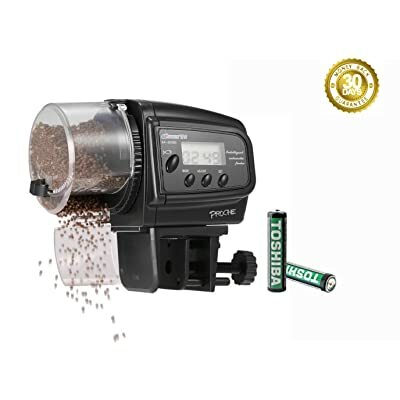 The PROCHE Digital Automatic Fish/Turtle Feeder features a simple design and effective layout. This automatic fish feeder comes with a clear and well-written manual, making it easy to install and use. You can control this device precisely to the exact amount of meal you want it to dispense, as it offers a great deal of flexibility when it comes to the way your fish is fed. This automatic fish feeder allows a total of 4 feeding time on a daily basis. It is also capable of accommodating a wide variety of foods including crumbles, pellets, or flakes. It also features an adjustable slider that lets you adjust the quantity of food that is provided per feeding, this will enable you to customize the feeder to suit the need of your fish. It also features a programmable digital clock that lets you set up the system. This automatic fish feeder is powered by two AAA batteries that keep the system operational for a very long time. ADA Automatic Fish Feeder comes with some dynamic features. 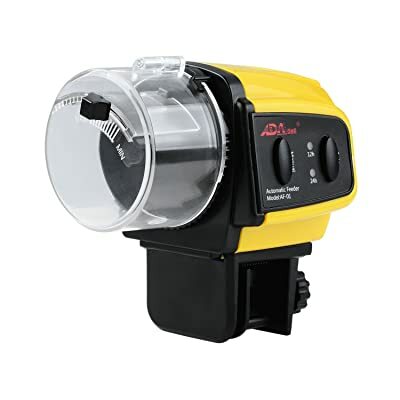 This automatic fish feeder features two different modes: Auto and Manual. The ‘auto’ mode allows you to feed your fish at a specific interval of time, while the ‘manual’ mode allows you to feed your fish whenever you want manually. Whenever you press the manual button, the feeder will rotate once. The auto mode allows a maximum of two feeding times every day. It also has a very good power consumption as it uses two AAA batteries that can last for six months and more. 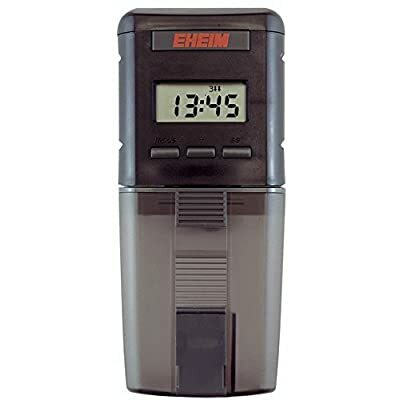 The feeder releases once every twenty-four hours when you press the “auto” button once, and it releases food once in twelve hours when you press the button twice. The feeder also features an adjustable feeding capacity that can allow you to store enough food for your fish. The device is also housed in a plastic material that makes it easy to install on fish tanks. This fish feeder is not ideal for fish with complex feeding pattern. You don’t have to worry about the feeding of your fish where ever you are, neither will your fish starve whenever you are not around. It offers a whole lot of benefits, and here are some other reasons why you need it. With an auto fish feeder, you can program the feeding interval of your fish, and this minimizes the chances of underfeeding or overfeeding. Since food is being dispensed automatically, it gives you the time and freedom to do other things. Food wastage is minimized to a great extent with this option of feeding. Based on the reviews we have provided above, our pick is the Eheim Battery Operated Auto Fish Feeder. This is because of its unique features, including LCD display screen, a ventilation system to keep your fish food dry always, large food storage capacity, easy to install and use, suitable both fresh and marine water fish, and it can dispense food 8 times a day. Based on its features, it’s an ideal option for every aquarist.